Truman is a 10-year-old light brindle male born in 1999. He is not tattooed because as a puppy his left leg was mangled by his mother. Nothing was done to his leg at that time, and he uses it, although the foot turns in at an angle. Truman also has Pannus in his left eye which is indicated by a white area - it appears he has limited vision out of this eye. 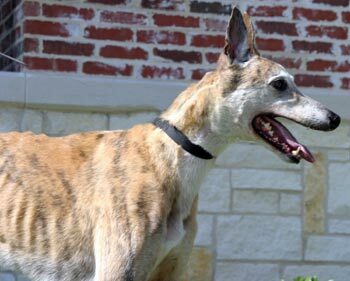 Truman, along with Lady, was in a home for almost 10 years in the Oklahoma City area. Because the owners were moving, a plea was sent out to surrender them both to an adoption group. 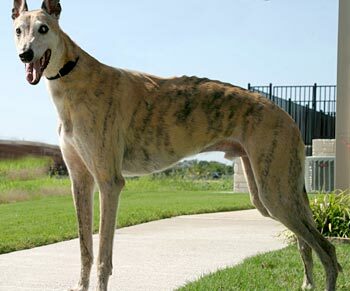 They both came into GALT's family on August 2, 2009. Truman was very, very stressed when he arrived and for several days thereafter. Truman was evaluated by Dr. Jeff Ellis of VCA Preston Park Animal Hospital, and he is being monitored for suspected lumbosacral stenosis. Thankfully a foster home came forward to take him by August 5. He has settled down and loves to give kisses! He is living with several cats, a yorkie, more greyhounds, and gets along with all. 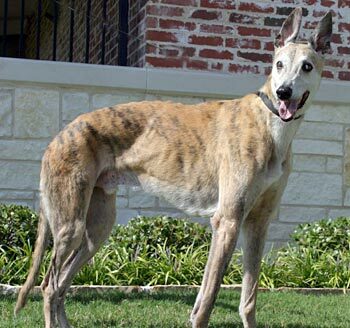 If you are looking for a senior grey with a heart of gold and a beautiful spirit, Truman is the perfect boy for you. He is currently living quite amicably in a home with three cats, a Yorkie and two other greys -- so it's safe to say he can get along with just about anybody! He sometimes barks at the cats but won't go anywhere near them. He also backs off quickly when he is reprimanded. Truman loves to be in the same room with "his people" but also enjoys big fluffy dog beds in other quiet rooms in the house. In the short amount of time he has been a guest in our home, Truman's personality has really begun to emerge. He was very thin when he arrived but has gained about seven pounds since we brought him home. We usually feed him three small meals a day -- rather than two larger meals -- because he seems to really enjoy his mid-day meal. Truman loves treats and will stand quietly beside you when you are handing them out, even when the rest of the menagerie is chaotically swirling around him. As with every other grey I've met, Truman loves to go on walks. I usually take him out for a short stroll without the other dogs, as they tend to "weave and bump" -- and Truman is somewhat unsteady if there is a lot of action close to him. He climbs stairs like a champ and usually sleeps in our bedroom with his head either under the bed or under a pillow. It's an endearing, quirky trait; perhaps I should get him a fancy blindfold so he can enjoy the total darkness he seems to crave! Truman has a mind of his own and is not necessarily a creature of habit. Sometimes he just sleeps downstairs. There doesn't seem to be a pattern as to where he sleeps, but he definitely like quiet places. For that reason, he would probably do best in a nice, calm home. A house full of kids with a high level of energy and boisterous activity would probably not be a good fit for this quiet boy. We have all wood and tile floors, and Truman has fallen on the wood floors two or three times -- primarily when bumped by other greys racing to "answer" the doorbell. He has had no trouble on the tile, since it is not quite so slick, but he is somewhat unstable on wood. The few times he has fallen, his legs flew out from under him and he cried out in surprise -- probably more frightened than hurt. It's a little hard for him to get back on his feet, so we just gently give him a hand. He is now very careful on the wood floors and wisely stays clear of the pack when they make their mad dash for the door! Truman gets a little stressed when his environment changes. The best remedy is to let him just lie quietly nearby while you work, eat or watch TV. He is very comforted by the presence of his humans and is happiest when he is close to them. My favorite "Truman thing" is that he just loves to give big, huge, sloppy kisses all over your face. He dances around and when he is through kissing, he snaps his teeth to let you know he is through with you. He does love to be petted, and I sincerely believe that he doesn't realize that he has a few infirmities. If you meet this sweet boy, make sure you are: (a) prepared to fall in love; and (b) ready to enjoy being the recipient of unbridled, unconditional love and affection!